Rhythm, Metaphor, Politics. Cambridge: Harvard University Press, 2013. 367 pp. One of the rewards of long-term immersion in a linguistic environment not one’s own is a heightened awareness of language features that pass unnoticed among native speakers. 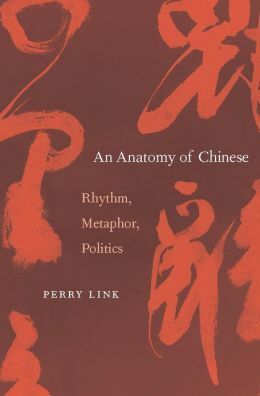 Perry Link’s latest book, a collection of rich and often provocative ruminations on what he fittingly calls the “anatomy” of modern Chinese, emerges from three decades of close observation of a language which has proven, for him, a boundless source of intellectual fascination. Readers familiar with the now centuries-old obsession in the West with the nature of the Chinese writing system and its relationship to various presumed qualities of Chinese poetry, religion, or philosophy will be glad to know that Link has prudently left these tired debates behind, being guided instead by a series of fresh questions concerning ways in which specific features of the Mandarin language spoken in the modern PRC are both grounded in and helpful in revealing various aspects of that society’s complex literary and political heritage. It would surely be tempting, in pursuing such a project, to conjure up a unified theory to explain and give a coherent narrative shape to one’s findings. The very notion of “Chinese culture” or of any of its components tends to encourage an essentializing mindset, and there is no shortage of recent books by established scholars, Chinese and non-Chinese alike, that purport to explain the nature of “Chinese poetry” or “Chinese thought” according to sharply reified distinctions from their “Western” counterparts. Here, too, Link’s approach is a refreshing one: he is far more interested in the process of working carefully through a well-defined problem than positing a sweeping solution to a broadly framed one. His methodology, in each of his three main sections on rhythm, metaphor, and politics, is to present a rich—and often delightfully entertaining—selection of examples illustrating a particular linguistic phenomenon, and then to ask how this phenomenon might have come about and what its implications might be. One of the many pleasures of reading his book is the candor and, one might even say, ingenuousness of his process of discovery. He consults a broad array of scholarly sources—from the fields of philosophy, linguistics, poetics, and cognitive psychology, among others—in developing his arguments, but does so in a transparent and accessible way, admirably free of jargon and the usual academic one-upmanship, and largely unconcerned with taking sides in the pitched battles some of these works have provoked among specialists in their respective fields. The puzzle that motivates the book’s first section has to do with the origins and purpose of characteristic rhythmic features of modern Chinese prose. We normally think of rhythmic patterning in language as belonging to the realm of poetry, where, like rhyme, it contributes to the experience of formal coherence and self-conscious artistry distinctive to this genre. Ordinary language we tend to imagine as being considerably less artful and more pragmatic, concerned, as it is, with the prosaic business of communicating ideas in a reasonably efficient and straightforward manner. Link offers dozens of examples, however, to demonstrate how even the most ordinary of ideas in modern Chinese very often find themselves expressed in phrases that adhere to deep-seated rhythmic rules and patterns. A sign urging pedestrians to look both ways before crossing a busy street takes a rhythmic form dating back to poetry of the Han dynasty (206 BC-220 AD). A standard list of kitchen staples—kindling, rice, oil, salt, soy sauce, vinegar, and tea—turns out to use exactly the same rhythm. The literary origins of such metrical patterns are easy to discern within China’s rich poetic heritage. Considerably more tangled are two questions Link dwells on at considerable length. Why, first of all, should these patterns have the staying power that they do, especially in a society whose revolutionary heritage has so often entailed an explicit repudiation of “traditional” or “feudal” cultural forms? And second, what does the invocation of such age-old poetic rhythms contribute to the meaning of a seemingly colloquial statement? Link prudently refrains from definitive pronouncements on either of these questions, but considers instead a variety of hypotheses, ranging from the implicit authority of China’s literary heritage to universal human preferences, that help to illuminate them from complementary perspectives. The second section is the most explicitly comparative in orientation. Inspired by well-established scholarship on the cultural workings of metaphor by George Lakoff and others, Link ponders here the ways in which established metaphors in modern Chinese structure basic forms of thought in a manner at times similar to and at times curiously different from those familiar to native speakers of English. While the idea of passing from consciousness to unconsciousness is imagined in terms of spacial movement in both Chinese and English, for example, Chinese speakers are more inclined to think of this transition in terms of a coming or going across a divide, whereas English speakers speak of “falling asleep” or “sinking into a coma.” While similarities in basic conceptual metaphors in the two languages outnumber the differences, a number of distinctive metaphorical predilections in Chinese make good food for thought. Idiomatic uses of the verb chi ‘eat’ in Chinese, for example, are far more prevalent than in English, so that one can describe the enjoyment of popularity, for example, as “eating fragrance,” male flirtation as “eating tofu,” accepting blame as “eating crime,” or feeling jealous as “eating vinegar.” More congruent, perhaps, with stereotypical notions of “Chinese culture” are the governing metaphors of government as family and public behavior as stage acting, Link’s numerous illustrations of which provide for striking insights—into the importance and moral value in many contexts of correct outward performance, for example—without lapsing into sweeping categorical claims. Perhaps the closest Link ventures to such a claim is in his discussion of ontological metaphors—the abstract nouns we fashion out of verbs and adjectives in order to manipulate and express ideas at a remove from concrete experience. It turns out that speakers of European languages are far more inclined to rely on these second-order nominalizations than are speakers of Chinese, so that the former habitually speak of, say, “inflation,” “energy,” “existence,” “patience,” “confidence,” or “truth,” whereas Chinese renderings of corresponding ideas are more likely to rely on verb and adjective constructions. Whereas others who have noticed this difference have sometimes presented it as evidence of a structural lack in Chinese methods of reasoning, Link turns the tables to reflect on the possibility that habitual nominalization has tended to lead thinkers working in Indo-European languages down all manner of blind alleys that are, in reality, nothing more than metaphorical fictions. To what extent does our belief in the real existence of “government,” say, or “the good,” and our willingness to devote centuries of debate to their description and analysis, derive from the mere linguistic quirk underlying our propensity, as speakers of English, to traffic in nominalized abstractions? While broad generalizations of this kind will no doubt raise red flags for some readers and bring to mind significant counter-examples for others, Link’s deployment of an observed cultural difference to invite linguistic self-consciousness and unsettle complacencies represents one of the more responsible and productive uses one can imagine for comparative work of this kind. It is regrettable, then, that Link does not seem particularly interested in rethinking some of his own formulations in the light of his conclusions. One can’t help but notice, for example, after reading this section, the extent to which he relies throughout the book on the familiar ontological metaphor of “meaning” in his own attempts to think through the linguistic puzzles that he poses. Based on his diagnosis of an excessive reliance on nominalization in English-language scholarship, in particular, one might suppose he would have been better served, for example, by pressing a little less arduously on a highly abstract question like “What is the meaning of rhythmic patterning in language?” and asking, more directly, “What does rhythm do?” The difference here might seem slight at first glance, but his own quite compelling analysis suggests that the latter formulation might well open up a less rigid and static framework for making sense of what are, after all, rather transient linguistic effects. It is in his final section on politics that Link attends most explicitly to the instrumental functions of language. His emphasis here is on the official language of the PRC bureaucracy, and in particular on its characteristic use of abstraction, euphemism, and repetition as means of lending an air of legitimacy and rationality to propagandistic fictions. Every authoritarian regime deploys such techniques to dehumanize its opponents and pass off its justifying ideology as unquestionable truth, and there is much here that will be familiar to readers of Orwell, Kundera, and historians of the Third Reich. Systematic killings under Mao, for example, were described as “cleansing the class ranks,” giving an air of a wholesome ablution to acts of state-sponsored brutality, while a lilting slogan calling on citizens to “love the country, love the Party, love the people” encouraged not just mindless obedience but an unquestioning belief in the equivalence of the three prescribed objects of esteem. What’s most interesting here are the decidedly Chinese twists on the uses of political language in the PRC context. Link builds on observations in earlier sections of the book to describe, for example, how Cultural Revolution slogans gained (rather paradoxically) from their adherence to age-old Chinese rhythmic structures a sense of indisputable correctness that largely masked their hopeless vagueness or even their inconsistency with the prevailing slogans of the previous week. Likewise, the fastidiousness of adherence to prescribed formulations Link finds throughout the Maoist era resonates with a traditional Chinese emphasis on correct performance over other measures of a statement’s value, an emphasis reflected, according to Link, by the language’s abundance of theatrical metaphors. It has been acceptable at certain moments, then, to refer to China as “a society that has classes” but dangerously heterodox to suggest that it is “a class society.” On the flip side, the richly homophonic nature of spoken Chinese opens up endless possibilities for punning, which has often been used, along with parody and double entendre, to satirize the hypocrisy of official speech and to dodge the effects of widespread censorship. For all the comic relief offered by occasional acts of resistance, however, Link is understandably pre-occupied with what the long-term effects on public culture might be of several generations of Chinese living and breathing a language so severely twisted and constrained by the machinations of a repressive one-party state. While he does not underestimate the difficulty of recognizing, let alone breaking free of a tainted or impoverished language, he sees cause for guarded optimism in the opportunities for greater freedom of experimentation and self-expression that technology has made available in recent years. Link’s reflections on public language as itself a casualty of the Mao era are, in the context of a book often brimming with delight in the marvels of Chinese linguistic forms, poignant and often profound in their implications. At times, however, he seems so caught up in deploring the language manipulations of Communist party hacks that he loses sight of the many available historical and cross-cultural reference points that might have enabled him to situate these phenomena in a broader context. The first two sections of the book are laudable for the richness of the comparisons they offer to both Chinese literary history and other languages. This final section would have benefited from a similarly capacious perspective. The characteristic formulations he associates with Maoist propaganda, for example, would appear to share a common lineage and, presumably, common rhetorical strategies with moralizing tracts in the Buddhist and Confucian traditions. And surely the dangers of becoming trapped within the confines of a dominant ideology are not limited to authoritarian states, though they are obviously more pronounced there. Whatever other linguistic blind spots may afflict them, China watchers outside of China presumably do lose sight, on a regular basis, of the degree to which the lived reality of people in China is mediated through the distinctive historical and formal features of their language. For those whose knowledge of China comes primarily through books and articles in English, the characteristic cadences, tropes, and figures of modern Chinese are largely invisible and their effects, likewise, unseen. Perry Link’s eminently readable book makes a welcome contribution in mapping, with admirable care and acuity, the distinctive contours of the linguistic landscape within which modern Chinese history continues to unfold.